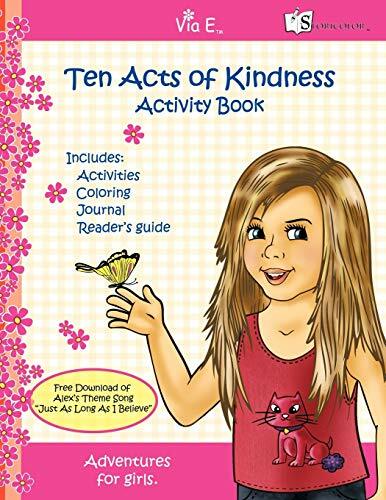 The Ten Acts of Kindness Activity Book test reading comprehension, has an open learning discussion section for mother and daughter time or group study, and many fun activities designed for maximum learning enjoyment. Includes daily journal, thirteen activities, free music download and online support. Based on the Ten Acts of Kindness story book, it explores the magnitude small acts of kindness have on others and the hidden blessings received in return. Written from one girl to another, it is a precious lesson to share with girls, young and old. Alex O'Shay is an adventurous, curious girl who travels around the world with her family writing about her adventures, insights and mishaps that girls her age can relate to and learn from. With a little help from Via E, she publishes her stories and encourages all girls to do the same. Ellen Callen, mother of four, business executive and educator of ten years, takes the lessons found in the original Ten Acts of Kindness book and creates a workbook aimed to help mothers and home schoolers create a fun, creative learning experience based on Alex's story.